It’s All about Magnum Ice Creams! Who can resist ice creams… Magnum ice creams? Certainly not Moi! With an exclusive invitation to a sneak preview of Magnum’s new flavors, it was an invite that was simply irresistible. The event for pleasure seekers was held at Renoma Café deep in the heart of the city. Upon arrival, we were pampered and showered with much chocolate and ice cream all the way! Magnum, launched in1989, is simply famous for its first chocolate covered ice cream. It may be a classic combination of man’s best friend ever paired. Put on your imagination cap and imagine sinking your teeth lightly to crack the deep rich chocolate to unveil a luscious vanilla ice cream sending neurons of happiness to our senses! Entering the lair of the ice cream party, there were quite a few booths that set up the mood for the night. First booth up, get your best pose ready for camera, lights & action! Met up with Sui Ying and her friend, Mun there that day together with Xiang and the second thing we did was personalized our very own cupcakes at the dessert bar manned by Just Heavenly. Needless to say, we had loads of fun icing our cupcakes! Look who I caught on my lens… Xandra Ooi who was our emcee for the night posing with Mike. After our cupcakes creation, we whipped off to find a spot while indulging in our very first Magnum bar jazzed up with a luscious cheese mousse and chocolate of course! Another station had us icing our own chocolate bar… cute! The evening took off with much casualness and guests were encouraged to tweet to win some prizes. My admiration goes to Kelly (second from the left) who really worked her way to winning with her tweet while having her manicure done! How’s that for multitasking? *Psst… even the walls have chocolate dripping down…drools. After a little snack, lots of liquids and all the Magnum ice creams you can indulge, the much anticipated flavors were revealed! Magnum Chocolate Brownie and Magnum Chocolate & Strawberry are proud to be the latest addition of flavors to the Magnum family. While the Magnum Chocolate & Strawberry was tempting with laces of strawberry in the vanilla ice cream, Magnum Chocolate Brownie sent me to heaven! Magnum Chocolate Brownie is double the chocolate sensation with a nutty chocolate crust encasing a luscious silky chocolate ice cream. Both were served with sides of luscious cream and crème brulee… please don’t wake me up! As if it was not enough, we were also treated to more Magnum inspired ice cream desserts like mini Magnum parfaits and Magnum ice cream sandwiched with macarons. Magnum-li-cious… what’s your favorite Magnum? 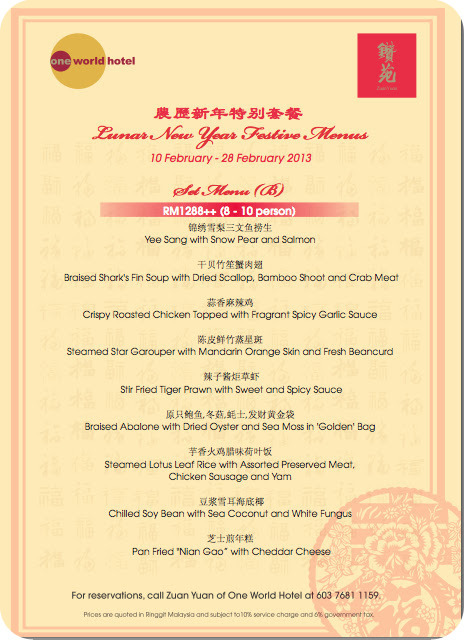 Zuan Yuan, One World Hotel: Cheering to Sau Kong Chau Celebratory Menus and More! 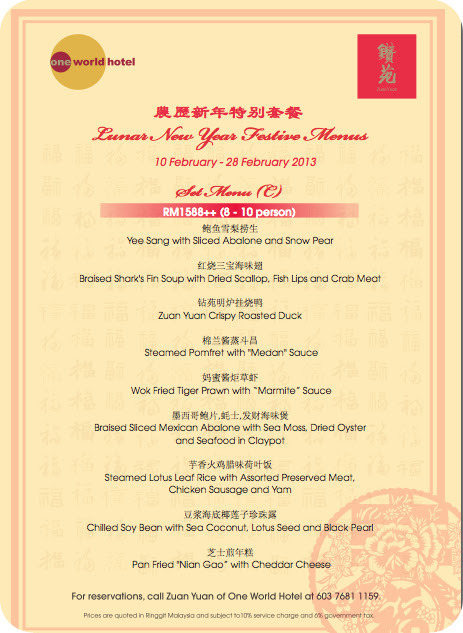 Feasting on Chinese New Year Set Menus & Festive Dim Sums! While the countdown to the coming Chinese New Year holidays is much anticipation, a lot of companies take their employees for ‘Sau Kong Chau’ feasts just right before the festival. It is almost a tradition for some while others take pride in this excuse to enjoy a feast together for some merriment. 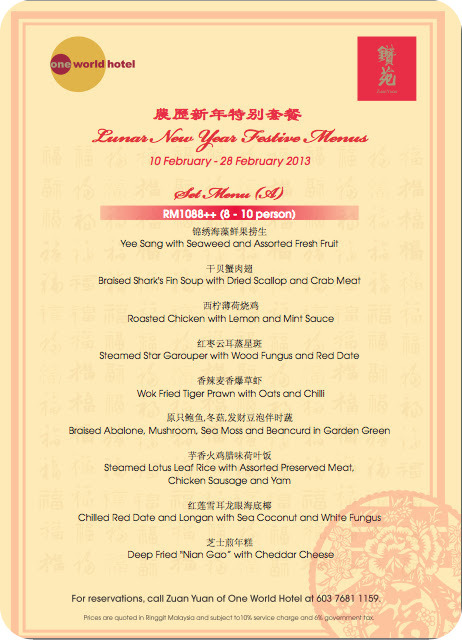 At Zuan Yuan, One World Hotel, the restaurant is set to cater to the many request of the Sau Kong Chau or Appreciation Pre Chinese New Year Feast with their celebrative set menus, traditional Yee Sang and Chinese New Year specialties for lunch and dinner. 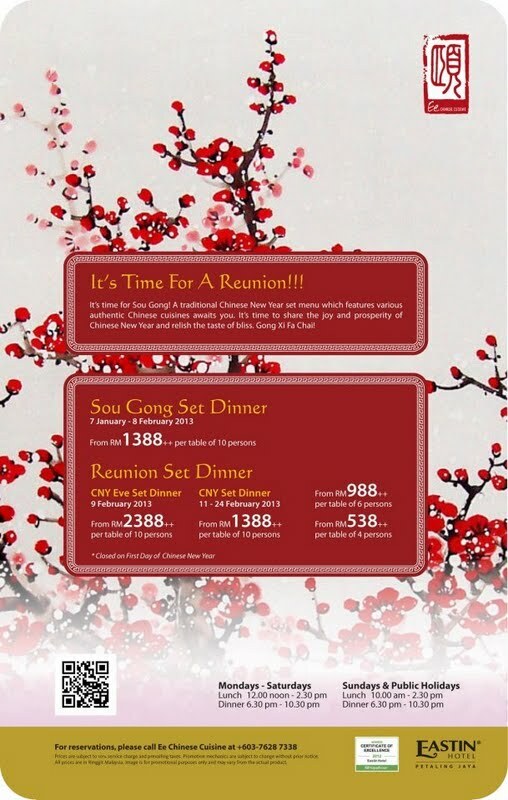 Let’s not forget the essential Reunion menu, Lunar New Year festive menu and there is even a sumptuous festive dim sum specially prepared by Zuan Yuan’s culinary team. Culinary team of Chef Woon Ting Keat and Chef Chin Chee Heong are responsible for this year’s festive menus with a little of everything to ring in the auspicious New Year. Head on over to Zuan Yuan to catch a taste of their Sau Kog Chau menus, Reunion Joy menu, LunarNew Year Festive menu or simply enjoy their Chinese New Year Dim Sum menu! Recently, we congregated at Zuan Yuan for a taste of the festive menu and feast on a lavish spread from sumptuous Yee Sang to glorious Roasted Duck and ended with a modern take on Nian Gao. If you are still looking for a place to enjoy some festive dishes, check out the dishes here at Zuan Yuan. Decadently amped up with crispy fried soft shell crab and chewy jelly fish, it’s a myriad of textures in this version. The sauce carried a tangy and gingery note with subtle sweetness throughout. It’s beautifully refreshing and juicy with each bite. Priced from RM55++ per half portion for lunch, dinner and takeaway. This may hit some high notes with some while others steer clear of it. As repeated before, it’s the soup that I really loved and not the fins as it is more of a sign of lavishness. The version here has a delightful broth base coupled with loads of crab meat and dried scallop beside the shark fins. My personalized version is always laced with a dash of black vinegar which really amped up the soup. The soup would be equally good without the shark's fin in my opinion. Though a roast is quite classic, when its done well, it can really bring lots of satiation to one’s taste. Executed with precision, Zuan Yuan Crispy Roasted Duck really takes the cake in a darn awesome roast! The amber hued duck with its crisp skin and tender meat was unbelievable good. It was also not too fatty but utterly moist with each bite. Flavor was definitely toothsome and addictive. A masterpiece! The festive New Year calls for fish to represent each year to always have something left with its infamous phrase of ‘Nian Nian You Yue’. At Zuan Yuan, we savored a taste of familiarity with its Steamed Star Garouper with Wood Fungus and Red Date. A sense of contentment echoed in the flavors with its gentle sweetness of the red dates, slightly crunchy wood fungus, Enoki mushroom and supreme soya sauce. The fish itself was also delicately sweet and flaky. It’s a hearty and wholesome fish. They say laughter is the best medicine! With prawns signifying laughter, one would definitely laugh happily at this lovely dish of Wok Fried Tiger Prawn with Oats and Chili. The huge crustaceans are nicely coated in crispy golden oats and aromatized with lots of curry leaves. A bite of these succulent prawns had shots of umami flavors stirring in my neurons! A pot filled with luxurious treasures from the sea, one cannot help but relish in this king’s ransom of goodies. From its supple texture of sliced abalone to the spongy fish maw, sweet prawns, succulent scallops and robust dried oysters, they meld together in a symphony of harmony. The brown gravy was oozing with rich seafood essence delightfully. Refreshing completed the description for this dessert. Well chilled with an abundance of longan, sea coconut, white fungus and red dates, it makes a great sweet ending with lots of textures. Truly one of its kind, some will like it while others may not. A clever combination of sweet and salty, the Deep Fried Nian Gao with Cheddar Cheese proved to be a lovely combination in my books. One note for the dessert, it is best eaten when hot or warm for the full effect of the creamy salty cheese with the sweet sticky Nian Gao. In addition to a peak at the festive menus, we were also treated to a taste of their festive dim sum menu by Chef Chef Chin Chee Heong. Going all out, the dim sums are created with such finesse and boldness. 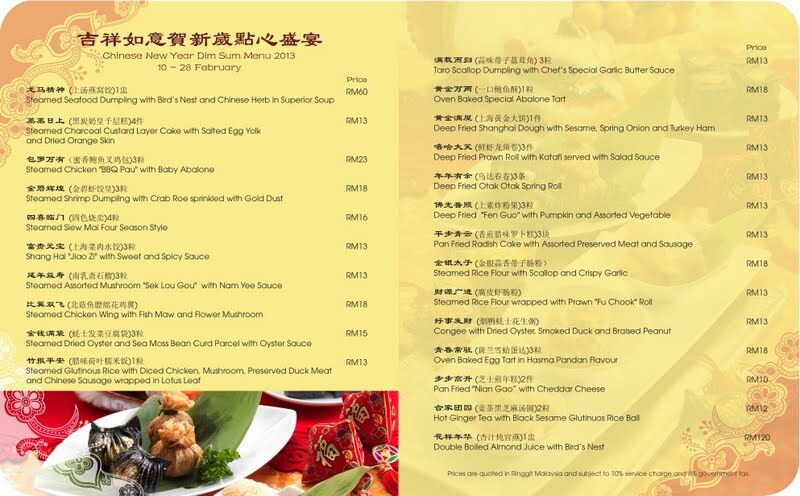 The Chinese New Year Dim Sum menu is available from 10th to 28th February. Kicking off the lot was a magnificent contrasting Steamed Shrimp Dumpling with Crab Roe sprinkled with Gold Dust that simply was a sight to behold! Audacious black charcoal skin engulfing juicy shrimps and a little crab is a beauty on sight and taste. Can’t taste the gold but it did gave me an exclusiveness of royalty. Simply a must-try! Mimicking money bags, the bean curd sheet pouch encased minced up assorted mushrooms and vegetables tainted with the flavors of fermented bean curd. Its decently light and juicy. The bags reflected wholesome and earthy flavors. This bundle of crustacean has prawns jacketed with crispy thin phyllo dough or Katafi and fried till golden. What makes the dim sum memorable was the side salad of strawberry, papaya and melon. The combination has a great contrast of crispy and soft, making the dim sum easy to enjoy. It’s definitely more than just the usual set menus at Zuan Yuan. Usher in your prosperity this year with their sumptuous Yee Sang, enjoy their gorgeous Crispy Roasted Duck or simply savor luscious festive Dim Sum. For a festive meal with the family or a gastronomic celebration with friends and business associates, make your way to Zuan Yuan Chinese Restaurant. Zuan Yuan remains open on the eve of Lunar New Year and throughout the fifteen days of the Lunar New Year. For dining reservations and more information, please call +603 7681 1159.